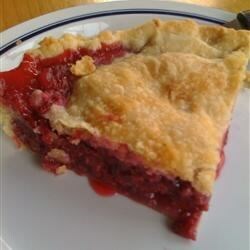 "With black raspberries being fresh, I have made 2 of these pies this week." Mix together raspberries, sugar, cornstarch, minute tapioca and water. Mix and let sit while you make your pie crust. (See double crust recipes on this site if you do not have a recipe). Put berries in bottom crust, and put 4 - 1 tablespoon pats of butter on top. Put on top crust and crimp edges. Make slits in the crust to allow the steam to escape. Bake at 425 degrees F (220 degrees C) for 15 minutes. Reduce heat to 350 degrees F (175 degrees C) and bake for 45 minutes. Very tasty recipe, but next time, I'll add less sugar and more cornstarch. Tasted like jam, almost, sooo good, but a little runny. Thanks for the recipe!